Companies Have a Vision – Why Not You? Picture this: You, 30 years in the future, being honored at a dinner. What would you like people to say about you at that dinner, both on- and offstage? What did you accomplish? Who did you most impact in a positive way? Where did you make your accomplishments? It’s all part of creating your Career and Life Vision, the topic that Chan drilled into during a recent Charlotte Center Lunch & Learn. As WFU Vice President of Innovation and Career Development, Chan works with students to help them transition from college to career. Chan acknowledges that the concept of vision can overwhelm, especially at the beginning of your career track. But when you break it down – vision leads to strategy, which leads to tactics or checklists – you can master it. To arrive at vision, Chan says you need to look at your core ideology, or who are you and what you believe; and your envisioned future, or what you aspire to become, to achieve, to create. Simply put, they’re your interests and passions. Core values – The timeless, guiding principles you care deeply about. These are things for which you would make serious sacrifices. Chan says everyone has four or five, but you won’t truly know them until life tests you. If you can envision living the value while suffering some cost, it could be a core value. An online search for value-sort exercises can help here. Core purpose – This is your enduring reason for being … and it can never be fulfilled completely. It doesn’t change; it guides and inspires your decisions. Disney’s is to make people happy. Merck’s is to preserve and improve human life. Passions – These are things or activities that excite you, energize you or bring you joy. They have deep meaning for you, and they might even address a deep need or problem in the world. Passions can, and often do, go beyond the boundaries of work. Sometimes your work supports your passions. He didn’t want to do it. It really wasn’t his passion. 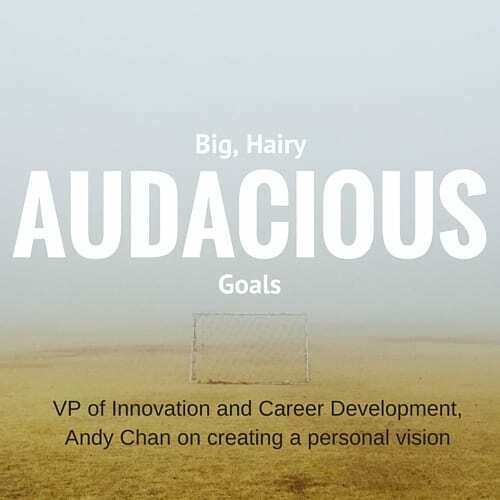 However, some of his passions have been addressed through the envisioned future process – and developing what he calls Big, Hairy, Audacious Goals, or BHAGs. As he worked as CEO of several California startups, he didn’t see how that would happen. Then the opportunity at WFU came up – and he’s achieving his BHAG. The BHAG concept has MBA candidate Rich Wolk (MBA ’17) of Charlotte Pipe and Foundry Co. thinking about his personal professional goals and re-engineering them. “Coming into my MBA, I had ideas to conquer the world and the c-suite,” he says. But life happens, and he got sidetracked. Now, he’s back. “If you have that vision down, you can compensate when your path gets off track,” he says. They are clearly articulated, bold missions that require 10-30 years to achieve. They produce the “gulp” effect. They’re not a sure bet. They might require extraordinary effort beyond your current capabilities and the environment. Each is tangible, clear and compelling. They energize and inspire to you. You can track achievement with specific metrics. They are consistent with your core ideology. And your first step to getting there is something like the Fast-Forward Exercise, Chan says. Do the exercise. Write down goals. Share them with someone you trust. See where it takes you.